Vela Hoboken! 6 Boutique designer unit condominium homes. PH 500 2551 sq. ft. 4 bedroom + den, 2 ½ Bath full floor condominium home w/ garage parking. Spectacular open concept living, dining, kitchen layout. Chefs’ kitchen featuring Hi-end appliances, 6 burner stove w/ direct vented hood, built in wall oven and microwave. 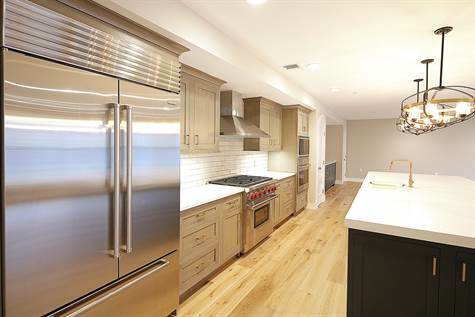 Custom cabinetry, stone counters, and an enormous Island w/ sink & built in top of the line dishwasher. Appointed dry bar / butler’s pantry, beverage center. Radiant heat floors in all bathrooms, Oversized Washer & Dryer area, L.E.D. recessed lighting, designer selected lighting fixtures, central HVAC, wide plank wood flooring, Solid wood doors, and all closets custom finished. Master bedroom with large walk-in closet and en-suite spa like feel master bath. Bonus Den separates the other 2 bedrooms offering many options for kids, home office, or guests, an entertainers dream, with NYC Views.